Dentistry has raised $ 315,371 from 76 gifts! 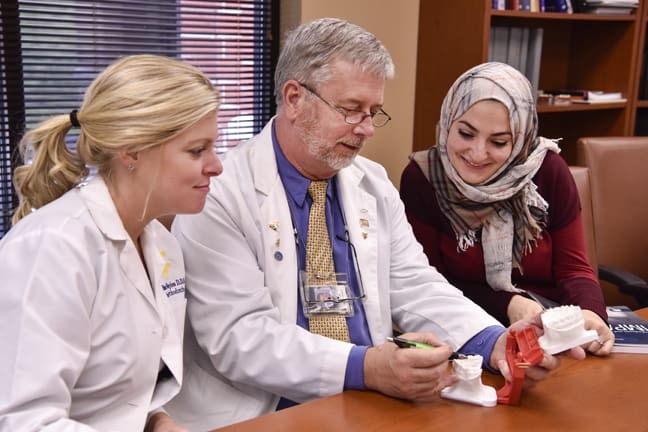 Your gift to the WVU School of Dentistry shapes the lives of students and advances the future of dentistry and quality of life in West Virginia. Dental education is constantly changing. At the same time, WVU is receiving less financial support from the State of West Virginia. The State Legislature has reduced institutional support by more than $38 million over the past four years. To adapt to the rapidly changing academic environment, we need the flexibility provided by gifts to our areas of greatest need. Your support ensures our future stability and helps us maintain our competitive edge. Gifts support the School’s most pressing needs, such as student travel to conferences, research funds, technology and outreach services. Dental school debt averages $170,000 for WVU students. Giving to the scholarship fund helps reduce student debt for dentistry and dental hygiene students. Gifts to this fund are critical to recruit and support the creation of the much-needed positions of Chair of Pediatric Dentistry and Dean of Research. Gifts to this fund support specifically the Department of Endodontics most pressing needs, such as student travel to conferences, research funds and outreach services. These funds need your support, but with the ever-increasing need for private philanthropic giving, a gift to any department or program in the School of Dentistry will be greatly appreciated. Your contribution — of any amount — matters. The School of Dentistry Alumni Association will match every dollar given up to a total of $100,000 to the Faculty Fund. If the School of Dentistry receives $10,000 in donations to the Faculty Fund on the Day of Giving, the initial donor will contribute $4,000 to the School of Dentistry Faculty Fund.